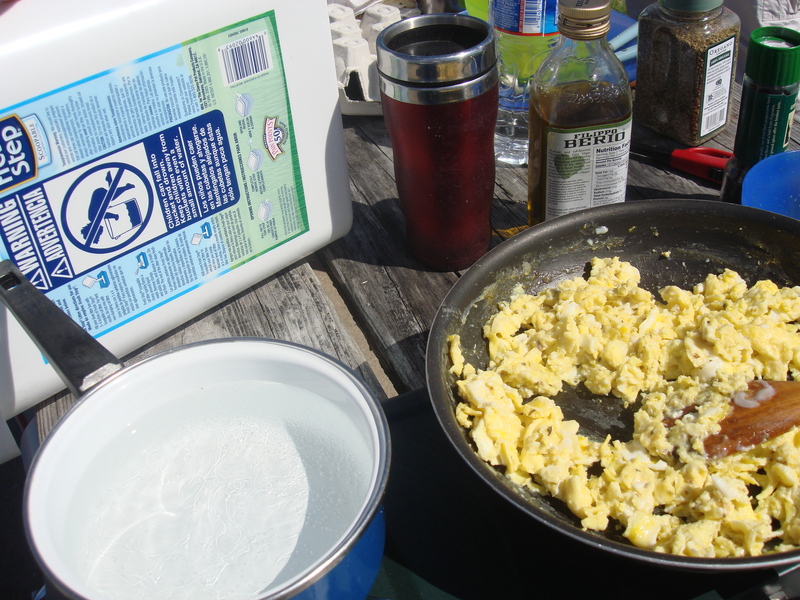 I love scrambled eggs anytime (and that includes lunch and dinner), but as a camping breakfast they are especially delicious (and quick and easy). We managed to find some terrific organic eggs at a supermarket during our week out in Montauk; if you keep your eyes sharp in farm country, there is usually a farmstand that has something fresh and local. You can tell an egg is very fresh if: 1) it stays completely on the bottom of a pot of water and 2) if the yolk is rounded (not flat) when you crack it open. IMPORTANT: If one end of the egg floats up it is quite edible, but less than fresh. If the whole thing floats, it’s rotten. While camping, eggs that are kept chilled will keep for about five days. And white eggs and brown eggs have no appreciable difference in nutritional value; some breeds lay brown eggs; some lay white. Brown eggs just look more virtuous and granola-y. Here, the addition of herbs and cheese makes a plain egg breakfast memorable. 1 tsp dried herbs (2 tsp if using fresh) I prefer straight oregano, but have also been charmed by Provencal-type blends. Thyme is lovely, as is parsley. Whisk (fork is fine) eggs lightly with milk and salt in a bowl. Heat the oil in a skillet until fragrant (a nonstick may need less oil). Pour in the eggs and lower heat. As the egg mixture solidifies, sprinkle herbs and cheese evenly over. Then, gently drag a spatula over the mixture occasionally as the bottom cooks. Cook to your preference, moist or dry and serve, with bread if you’ve got. Bacon is probably an obvious accompaniment, but on my minimalist camping menu that wasn’t happening. Campers can also serve with prosciutto or a cured sausage and a handful of grape or cherry tomatoes.